A dedication ceremony for Leo Giron Drive, a newly named street replacing a portion of Manthey Road near the forthcoming VA Hospital in French Camp, will take place Saturday, October 26th from 10 a.m to 10:30 a.m. The ceremony will take place near the intersection of Leo Giron Drive and Yettner Road. 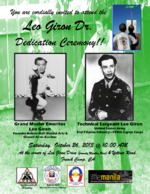 Leo Giron was a World War II veteran, a Filipino martial arts Escrima master, and founder of Bahala Na Martial Arts. During World War II, General Douglas MacArthur chose Giron to be a part of a select group of soldiers to travel by submarine behind enemy lines in the Philippines to provide intelligence on the Japanese military. This intelligence would be essential to U.S. forces and MacArthur's return to the Philippines and the defeat of the Japanese military. Giron was awarded with two Bronze Stars. A member of the Manong/Manang Generation (first generation Filipino Americans who came to America in the 1920s), Giron would make Stockton his home. He passed away in 1999 at the age of 88. The event is sponsored by Little Manila, Bahala Na Martial Arts International, Filipino American Heritage Association, The Inosanto Academy, American Legion Karl Ross Post 16, and American Legion Manuel Roxas Post 798.